As a print service provider you are always looking to streamline your workflow, to be able to realize a fast route to market for your clients. What about saving operating and training time with our easy to use inkjet print management software? 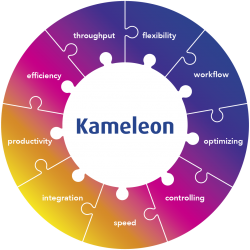 Kameleon is flexible, adaptive 'inkjet technology independent' software, which controls & combines various inkjet printing technologies. It boasts an intuitive, icon driven and efficient user interface. 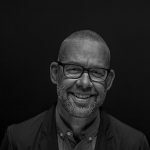 The simple, clear and consistent qualities of Kameleon make the Inkjet print management software easy to use and adopt. Leaving time for your operator staff to make a difference. Controller Software must be a sustainable investment. Kameleon is the pride and joy of our software developers. They make sure the application is continually updated in keeping with current and future inkjet technologies. And because imagination comes in different formats, Kameleon helps you cater to specific client needs. Its hybrid qualities make it compatible with your front-end system for effortless processing of various data streams and formats. Kameleon supports PDF, IJDPS, CSV, TIFF, BMP etc. Data ripping is on-the fly, saving you time and money. Kameleon inkjet print management software enables you to pick the right module to fit your print job. Accurate and attractive print jobs are an absolute must. Kameleon’s job-specific layout creator makes sure you can meet the demand. Choose from the extensive set of fonts and barcode library and easily import your data from a CSV file. Barcoding, addressing and labelling print jobs come out according to your made-to measure layout. Data integrity is important to your client for gaining and keeping customer confidence. When a print job has to match a pre-printed job, the Read & Print module is the way to go. By scanning a barcode on the pre-printed document, the Kameleon software will print the matching document. No image hassle. Print a folder of image files in different extensions in one print job. Also works standalone. Easy control of multiple printers? 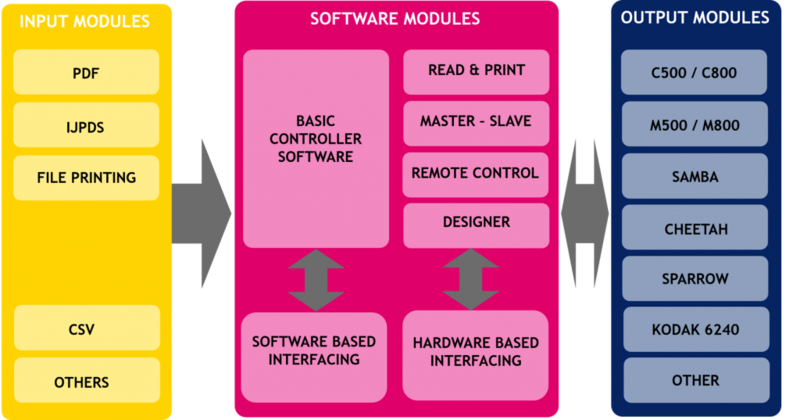 Master-Slave is an interface to set up multiple print heads and start your print application in just one touch. Easy does it. Minimize your start-up time to print and reduce data throughput storage requirements. Flexible rip settings make the data streaming modules’ set up simple. Streams data to print head directly in near real time. Inkjet means digital freedom. DJM is sure to provide an inkjet solution to match both your companies and your client’s needs.